Ultron had one goal. And that goal was to destroy humanity. Ultron is an artificial intelligence (robot) created by Henry “Hank” Pym, a founding member of the Avengers. Ultron attempted many times to destroy the world, but the Avengers stopped him every time. Some predicted he would succeed one day. And that day has come. Ultron has destroyed humankind. There are only a few survivors, scattered around the world. In the last issue, the surviving heroes travelled to the Savage Land, where they met up with Ka-Zar and Nick Fury. They soon learned, thanks to a dying Luke Cage, that Ultron is running his scheme from the future. Nick Fury has been preparing for the annihilation by Ultron for a long time, and has a stash of weapons and gadgets. He even has an Iron Man costume! So a small group of them travelled into the future in an attempt to take on Ultron. 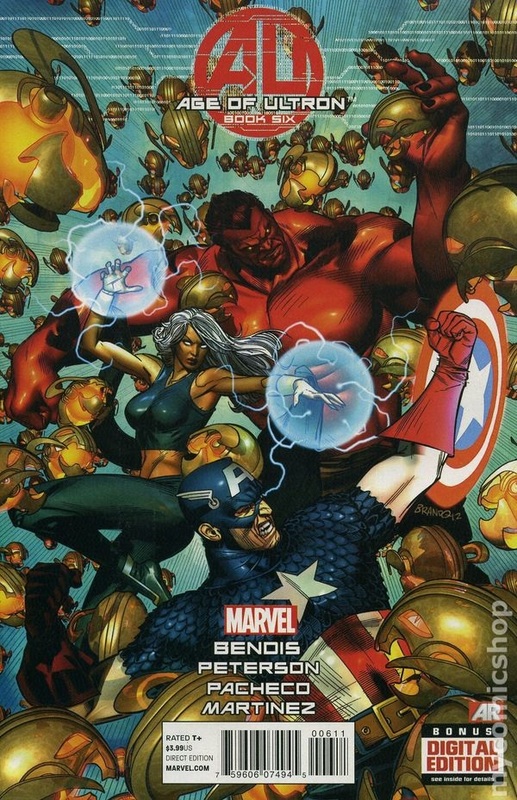 Some of the heroes include Nick Fury, Captain America, Storm, Iron Man and Red Hulk. However Wolverine had his own agenda: go back in the past to confront Hank Pym to try to stop him from creating Ultron. I blogged briefly about that in my review of Wolverine and the X-Men #27 AU. In Age of Ultron #6, by Marvel Comics, Wolverine has travelled back in the past to the Savage Land, Antarctica. Sensing someone other than himself, Sue Richard appeared. The two of them found Hank in the middle of an experiment. An experiment of advanced artificial intelligence. Wolverine and Sue confronted Hank, but it wasn’t a friendly meeting. Meanwhile, following Nick Fury’s lead into the future, the time-travelling heroes encounter an endless number of Ultron patrols. A long and hard battle follows. I am still enjoying the Age of Ultron mini-series. Brian Michael Bendis is the writer. The dialogue is well-written and each issue is always better than the last. I like the interactions among the characters. I am especially amazed at how well they are all working as a team. This story is not only about survival, but trust as well. With that being said, the only part about the story I didn’t like is Red Hulk’s interaction with Taskmaster. Whether or not you trust someone is not an issue right now. There are only a handful of survivors and teamwork should be prevalent. Red Hulk was quick to judge. That bought tears to my eyes. I highly recommend Age of Ultron.